It’s now two weeks since I returned from the Holy Land and its taken me this long to deal with everything that was waiting for me at home, but also to begin to get my head around what has been a truly amazing experience. Firstly, a short account of our last day. Setting off from Tiberius at the usual early morning start we headed for Caesarea Maritima, recorded as one of the great cities of Herod’s building passion. It was almost certain that it was here that Paul was to set sail for Rome. Fascinating area to explore, a 30 mile Roman aqueduct to bring water into the city, the Mediterranean sea-shore, the remains of Herod’s palace, the amphitheatre where stage productions are still held, and the chariot arena. Add to this a 30 minute film show about the history of the city and you begin to realise what a fascinating day it was and perhaps a fitting conclusion to our Holy Land adventure. What to make of it all ? Too much information to remember although some of it slowly trickles back into the mind and into conversation; moving experience which brought both inspiration and challenge in roughly equal measure; theology and churchmanship to the fore of my thinking; greater understanding of the Jewish and also the Muslim thinking; sadness over the deep divisions in the land; joy over the deep Christian sharing of Rami our tour guide. Alison and I set out thinking it would be our only opportunity to ever get to the Holy Land, but we returned thinking about how we need to return to experience more and enlarge our vision still further; great saving will ensue I think. I hope you`ve enjoyed following my blog and my experience; thankyou for sharing in it and for those who responded either on here or via FaceBook; it helped to make it even more special. When I can I intend to keep posting photos onto the Holy Land part of this blog. Our last full day in the Holy Land began with a truly memorable experience as we set off on a boat (@ 8.00am) across Lake Galilee. About 15 minutes from shore we shared in Morning Office followed by singing “Dear Lord and Father of mankind”. Another God-moment in the silence which followed. on the Lake for about an hour and then off to the village of Caperneum, “the village of Jesus”. Here we visited the fairly new building built over what may be the ruins of Simon Peters house. I liked this Church for its simplicity, and once again we sang. This time “Be still for the presence of The Lord” powerful stuff. this was followed by returning to the Lakeside where we shared in a truly moving open-air Eucharist. I found it special but then again I couldn’t hear the woman warbling in another party elsewhere and so nothing was spoilt for me. Sadly, it distracted Alison somewhat so her experience was difficult. on to a Franciscan monastry for lunch where we enjoyed St Peters fish, truly an ugly looking thing but delicious tasting. Afterwards we went into the Chapel, but it truly wasn’t to my taste, too dominated by crucifixes which doesn’t resonate with me but does for other members of our party. We then came back to the hotel earlier than usual in order to pack and get ready for an early start tomorrow, our journey home. We’re visiting one site tomorrow en-route to the airport and that will be the end of a memorable pilgrimage, so tomorrow’s report may well be later than usual. As with all the other days today has been a mixture of wonderful things, challenging things and disturbing things. firstly we climbed Mount Tabor, sounds good doesn’t it? Actually the bus took us part way and a fleet of taxi’s the rest of the way, but it was exhilarating sitting in a mini-bus type taxi as they hurtled around the hair pin bends on a road barely two vehicles wide! At one point the driver even took both hands off the wheel, but thankfully that was at the only straight stretch. As everywhere else the venue contained a Chapel, this time commemorating the Transfiguration; the meeting between Jesus, Moses and Elijah. Lovely Chapel, but outside the views were stunning? we then journeyed into a busy, bustling Nazareth to visit “the Nazareth experience”, set in the garden of the YMCA. It tells of what 1st century Nazareth would have been like. Outside there was a shepherd tending his sheep, a donkey owner, some others working a field, a carpenters shop and a home. Alison was able to answer a question about grape treading that no one else could answer. When I asked her how she knew it turns out it was in a cookery programme shed been watching a couple of weeks ago! Show off ! Very interesting talk and tour but topped when we came to a replica meeting place and here we were reminded of the story of Jesus taking up the scroll and reading it. One of our number, Penny, was invited to read the same passage using her kindle hidden behind the scroll. It was one of those moments, that have happened several times this week when a silence has just descended over us and no one has wanted to break it. Truly God-given. we then walked the streets of Nazareth, firstly to visit Christchurch, the local Anglican Parish Church, where we were made most welcome by the Vicar and his wife. This had been facilitated because of a twinning between his church in Nazareth and the church of one of our party, in Bakewell. Very simple and homely visit. Following this we walked across town to the second Church of the Annunciation, this time owned by the Orthodox Church. A much smaller building, but magnificently ornate and contains the spring used by Mary. We know this to be true because this spring dates back over 2000 years and is the knot one in the area. Consequently the Orthodox Church had built their premises here, nick naming the building as “Mary’s well”. 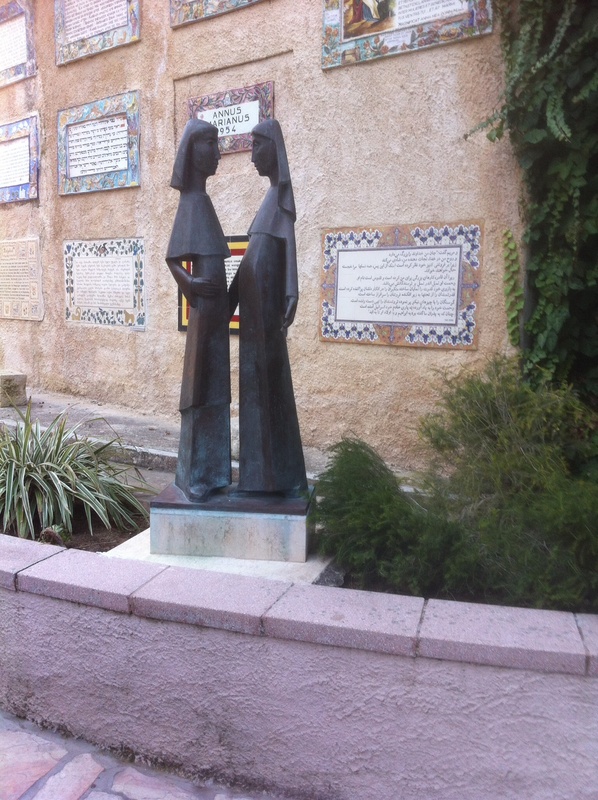 Which is the correct site of the visitation of an angel to Mary? Who knows and to be honest who cares? Sadly, in my view, too many do care. I was disturbed again by the crush to fill bottles of water and also by one lady to wash her face in the spring. Definitely not my tradition and I struggle to understand it. I actually had to leave because I found myself churned up over it and yet, in many ways, it was no different to the veneration of a piece of wall in Jerusalem, where I’d been so impressed with the devotion of the Jews. The older I get the more mixed up I feel and the more I realise I’ve yet to learn.. The day concluded with an early return to Tiberius, giving Alison and I time to walk into the town and experience a Jewish market and a very westernised high street. Having spent the morning in first century Nazareth, the early part if the afternoon in a current century Nazarene church and ending in a bang-up-to-date shopping street in Tiberius it really has been a day of contrasts. 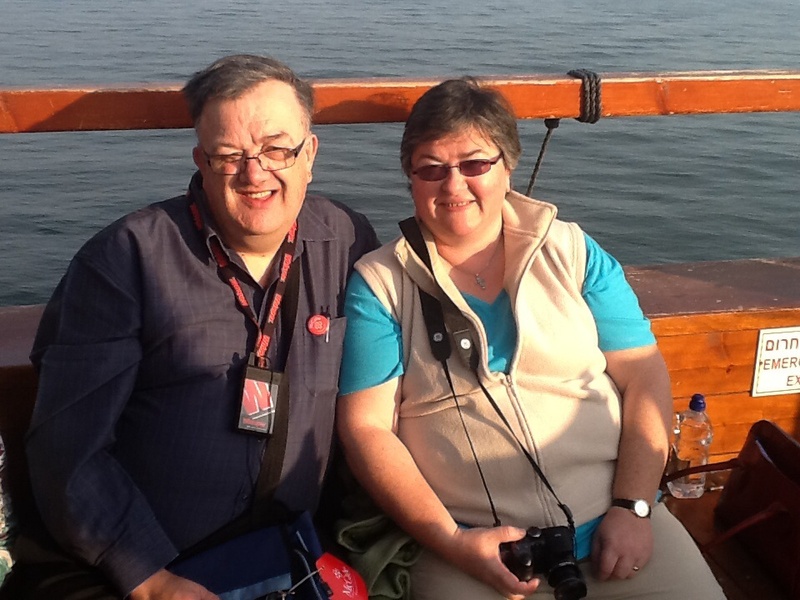 Tomorrow a trip on Galilee to begin with follow by a Galilean tour to bring our final full day to its close. Another good day, mixed in parts, but overall good. We began the day up bright and early at 6.00am as we wanted to get to the Wailing (or Western) wall and to the Temple Mound before morning worship at St George’s Cathedral. If you remember the word I used yesterday was “wow”: well, it’s the only word I can think of now. Unfortunately the internet here is refusing to talk to my phone camera so I can’t upload the photos at the moment. Nothing can prepare you for this experience. Security was intense and men and women separated both going through th x-ray scanners and also at the wall itself. On the men’s side of the fence our heads had to be covered with a skull cap and then we entered the area to see all the Jewish men praying at what for them is their holiest site: the only remaining wall of the Temple beneath which may yet be the missing Ark of the Covenant. Even though our thinking may be different I couldn’t deny the sincerity and devoutness with which they prayed. Oh, how I wish more Christians could have this level of commitment. After this we went through another security check in order to enter the Temple Mount, the sight of the original Jewish Temple, now long gone. However the land was acquired in the Middle Ages by the Muslim faith and they built a glorious Golden domed shrine to Mohammed alongside a Mosque. The reason for the security? 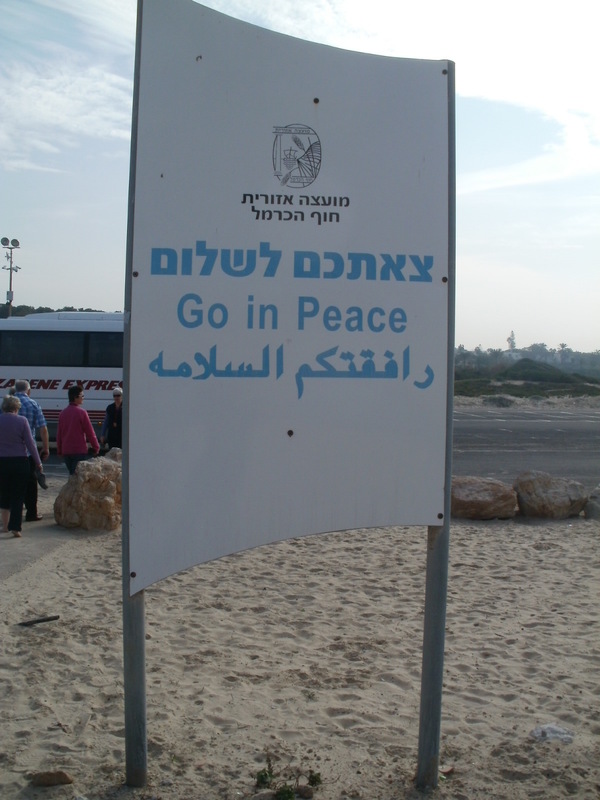 The Jews and the Muslims now both observe this area as holy, and often there is fighting on this site. The moving part was towards the end of the visit when we began to leave via a different gate, for this afforded us the view across the Kudron Valley into the Chapel of Dominus Flevit, where we began our journey last Wednesday. On our last day in Jerusalem we were able to look back to the start of the journey and reflect on how far we’d come in our pilgrimage. 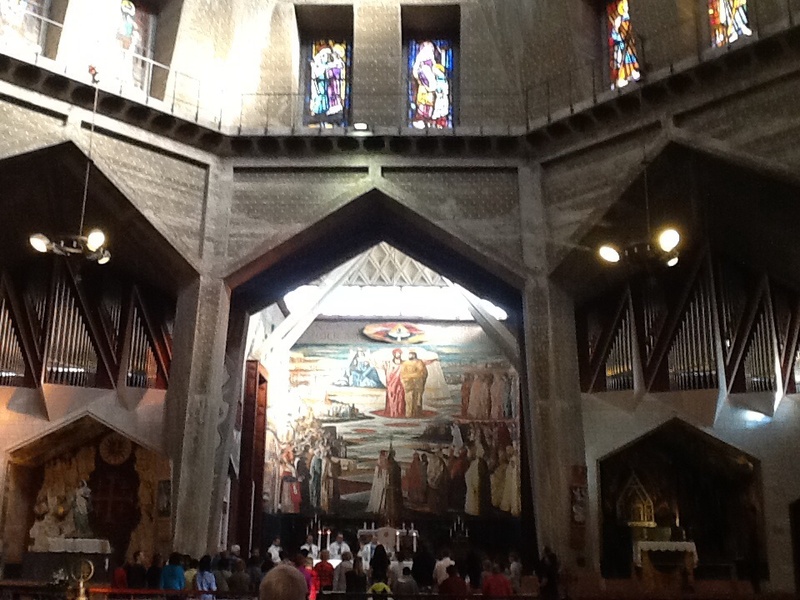 We then went to the Anglucan Cathedral of St. George for Eucharist. Afterwards someone remarked it had been the Anglucan version of “where are we now?” As it had all been in Arabic, even though the setting was familiar, most of us got lost. Even the final hymn by Charles Wesley, ‘Jesu, lover of my soul’ had a different tune and repeated the last line twice. I cannot say it was a spiritually uplifting experience (esp after our earlier moments at the Wailing Wall and the Temple Mound), but the coffee was good ! On the one hand disturbed by the crush, the superstition which seemed to surround the water, the lack of opportunity for reflection at the site, but on the other hand tremendously excited at the sheer number of folks going under the water in their baptism and the sheer sense of joy. It was a loud, boisterous occasion and it has left me unsure of how to respond, but I am grateful for the opportunity to renew my own baptismal vows. Near disaster as we began to leave, as I pulled out my camera. One of my SIM cards came out and went under the decking. Thankfully we could see it sitting on a rock but just out of reach for our fingers were too thick to squeeze between the slats. Out came team work. Someone produced some chewing gum, someone popped it into their mouths to chew it in readiness. Someone else then produced a bamboo shoot from a nearby tree, stuck the chewing gum in the end anden by poking it through the slats used the gum to stick the SIM card to it and raise it up close enough to the edge for someone with smaller fingers to reach in and grab it. Such ingenuity and team work comprising at least 5 different people. Very grateful. 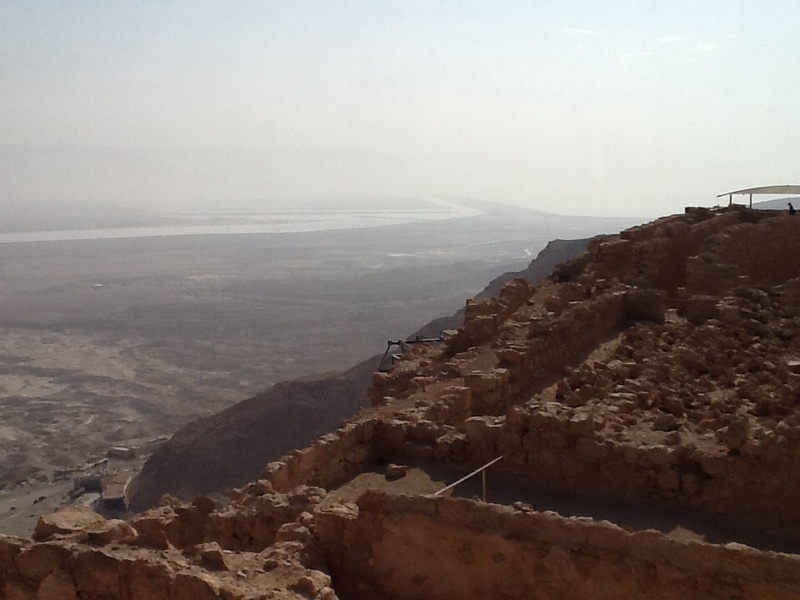 We travelled further onto Jericho for lunch and a quick stop at the foot of the Mount of Temptation where photographs of a camel were taken and Aluson bought some dates. I have to say I wasn’t impressed by Jericho at all. In short it’s a dump ! The only redeeming feature was the Sycamore tree allegedly climbed by Zacchaeus. Remy pointed out to us it couldn’t be the original as Sycamore trees don’t last 2000 years, but it gave us an impression and it was a lovely tree. And now here we are in our new hotel on the shores of Lake Galilee, at Tibetius. Believe it or not but these photographs are from our hotel balcony a few feet from the edge. Someone once said that of all the lakes in the world Galilee was the most beautiful. Well on today’s evidence I can agree. It’s so calm, and peaceful with the hills on the other side adding to the beauty. As the hymn writer puts it “………… Still, small voice of calm.” Tomorrow another early start as we set off but I’m not too sure where to! Alison thinks it might be Nazareth, Mount Tabor with the Church of the Tranfiguration. Wherever it is I’m sure it will be very special. As soon as I can get more photos uploaded I will do. A very special thank you to the good folk of the Methodist Borders Mission Circuit who very generously gave me enough finance last year as a leaving present to largely fund my trip to the Holy Land. 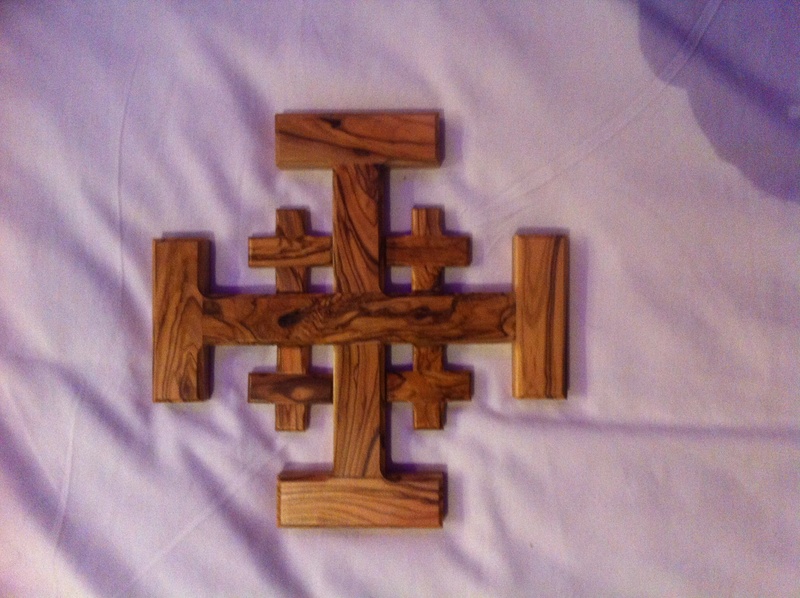 It has been memorable and in order to help me remember both my experience and also your generosity of finance, support, love and friendship I have bought this wooden Jerusalem Cross to hang in our current home. The Jerusalem cross contains four other crosses to represent the Gospel going into the four corners of the world (missional), the four Gospel writers (the keepers of the truth) and when added with the main cross (making five) we are reminded of the marks on the body of Jesus, his hands feet and side (his suffering for us). Thank you you once again. You will all have a special place in my heart for ever. Another busy and packed day today: this is beginning to feel like a fact finding mission with so much information that I can’t remember it all, even by the end of the day. Began by travelling out to Abu Guosh, which is associated with the resurrection appearance of Jesus at Emmaus. Here we celebrated Eucharist in the Monastry, surrounded by walls with part murals on. When the area had been taken over by Muslims in the Middle Ages or earlier, the faces of the holy people had been erased as they considered it disrespectful to show them. A simple, quiet and beautiful place, the Eucharist became even more powerful. And then on to the Church of the Visitation, associated with Mary’s meeting with her cousin Elizabeth where the baby Jesus ‘leapt in her womb’. Fascinating wall containing The Magnificat in umpteen different languages and a lovely statue of Mary and Elizabeth in front of it. After visiting the house alleged to be Elizabeth’s we went up the steps into the Church itself. Quite fascinating And very beautiful. after returning to Jerusalem for lunch we moved onto Mount Zion. All I can truly say is “wow”. Not particularly outstanding but the experience of being there was intensely moving. We began in the Upper Room which I think most of us felt wasn’t the original (it couldn’t be) but then we moved down the hill to the Church of St Peter in Gallicantu. This church commemorates the denial of Peter at the Last Supper. We heard the story again, read the Scriptures and when we began to sing the Easter hymn “Thine be the glory” it just caught me. Singing our hearts out with a huge painted wall of Jesus on the cross right in front of us was tremendous nous. Many of us let the tears and emotions go. But more was to follow, for we then went underneath the church to where there was a great pit. As we all stood in this pit we were reminded that it would have been something like this darkened place where Jesus would have been put awaiting trial. Then Psalm 88 was read which concludes with these words, “You have put me in the pit, in the regions dark and deep……………… You have caused my beloved and my friend to shun me; my companions have become darkness”. Try reading the whole Psalm as you imagine Jesus in a deep pit and you might begin to understand the sense of despair and desolation He must have felt. At the end of the Psalm there was simply silence; the moment was awesome and deeply, deeply spiritual. The atmosphere was electric and the sense of being in the presence of something far beyond our experience was tangible. After we came out we were shown what are called the Golden Steps. At first glance no more than a set of eroded steps and stones going down the hillside, but then Rami our guide explained that when they were discovered it was realised how they linked the Upper Room are at the top of the hill all the way down to the Kidron Valley and the Garden of Gethsemane. Jesus would’ve walked these stones from the Last Supper to the Garden and as Rami put it “He descended the hill a free man, and then returned up the hill arrested and facing judgement” It gets to you, the realisation that this is what God was prepared to do for us, for me even. Tonight is our last night in Jerusalem, for tomorrow we set out for Jericho, the Mount of Transfiguration, and finally the Sea of Galilee where we’ll stay until our time is over. Thanks for the encouraging comments people have given me over the last few days And for letting me share this wonderful experience.